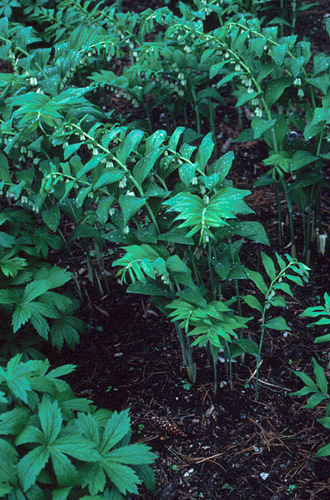 This tall-growing, woodland native brings drama to shady sites. 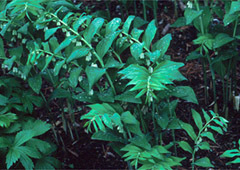 Arching plants feature attractive ribbed foliage, rows of small, bell-like, white flowers and blue-black fruit. Prefers cool, moist soil. Tolerates droughty soil under trees once established. Reaches maximum height under ideal conditions on woodland edges and with plenty of space. For small gardens, P. biflorum is a better choice, growing just 2-3'. Rows of ribbed 3-7" leaves. Flowers are small bells that hang beneath the foliage. non-aggressive - Provide lots of room. Spreading can cause problems in small gardens due to plants' large size. native to North America - United States to Mexico. bears ornamental fruit - Berries are bluish-black and last into fall. Propagate by seed, division or separation - Division is easiest method. Divide in spring. Make sure several each division has several growing points. Seeds need stratification (cold treatment) to germinate. Mulch to keep the soil cooler in the summer months. Seldom needs division. Divide in spring.